In large saucepan or skillet, place steamer basket in 1/2 inch water (water should not touch bottom of basket). Place cauliflower and garlic in basket. Cover tightly; heat to boiling. Reduce heat to low; steam 8 to 12 minutes or until tender. Transfer cauliflower and garlic to large bowl; add milk, 2 tablespoons of the butter, 3 tablespoons of the cheese, the salt and pepper. Blend with potato masher or electric mixer until creamy, adding more milk if necessary. Sprinkle with chives. Melt remaining 1 tablespoon butter; drizzle over cauliflower mixture. Sprinkle with remaining 2 tablespoons cheese. Serve immediately. Don’t have a steamer basket? Use the microwave instead. In large microwavable dish or bowl, place cauliflower, garlic and 2 tablespoons water. Cover (or cover with microwavable plastic wrap); microwave on High about 8 minutes, stirring once or twice, until tender. Let stand 1 to 2 minutes; drain. Continue as directed. You can make this dish ahead and refrigerate until serving. Reheat in the microwave, then drizzle with melted butter and top with Parmesan. Missing your mashed potatoes? 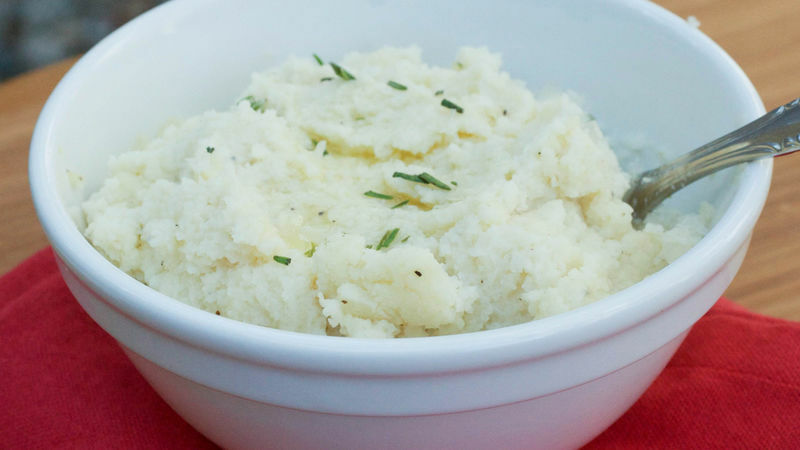 Add some to the mix for a potato cauliflower mash.